Today, when I woke up and looked outside, this is what I saw. It’s snowing I announced to Hubby (if you look real close, you can see the flakes against the house and flowerpot). Duh he responded (or something like that since I’m making all this up), why do you think I bought this when we were at Costco yesterday? Why yes! He–who never buys himself anything unless it involves electronics which he buys for me and uses as if they’re his–had actually thrown a new shirt in the giant cart I was pushing about looking at all the new stuff that had come in for Christmas. Talk about timely! He had dressed for the day in his navy velvety lounge pants paired with a gray long-sleeved pullover over which he was wearing the new FIELD & STREAM heavy cotton shirt he’d bought. (It’s a nondescript blue color that will go with everything.) All you need now is a lovely quilted lap cover to throw over yourself while you watch television news, I said, already having decided myself to cancel out the lecture we had planned to attend in town today, since I’d had a revelation. Today would be the perfect day to finish up that project I’d begun at least eight years ago when we were living in Las Vegas where it rarely ever snows. After I finished up my cold cereal for breakfast, plus reading all the newspaper and checking my email, I went downstairs to the first floor where my sewing room is. This is it. 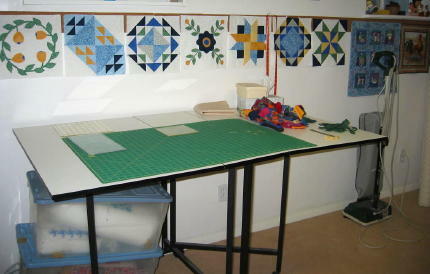 See those quilt squares tacked to the wall? That’s another project I started years ago and haven’t finished. It’s my sampler quilt and I’ve only three more to finish before I can put it all together, and have my very first (and last) full sized, homemade quilt made by moi. See those little stacks of fabric squares against the wall? 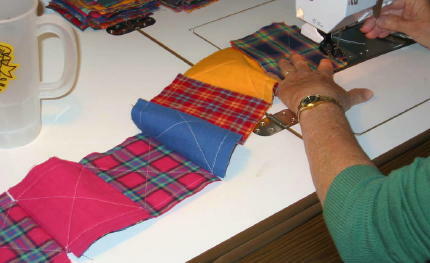 Those are 5″ squares of cheap flannel fabric; about half are plaids of different colors and half are solid colors that sort of match. Over the years I’d cut about 450 of those little squares, plus 450 little squares of cotton quilt batten 4 1/2 inches square. That’s a whole lot of cutting the same thing over and over and over and over. I’d get bored, set things aside for another day. But now I was determined to finish the darn thing. SH** or get off the pot as my old friend Barbara in Las Vegas would say. Hubby, who grew up in formerly British occupied India (until 1947) would say Defecate or abdicate but we Americans threw the English out long before I was born. Never mind that the solid colors didn’t always land up next to the square they actually matched. 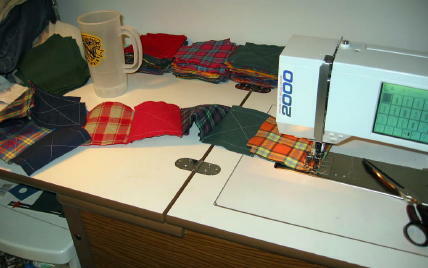 I’d asked Hubby if he’d take all the little squares and set them up in stacks so I could sew them together in strips. Rather than do the tedious task of matching each plaid to a proper solid square because that only meant it matched on one side, but maybe the other side didn’t. Capisce? (I’m sure you do! ), he decided to match things up in a 52-card pickup style* (I don’t think that’s original, but just in case I explain at the end* and **), saying it would look better if we acted like it they just fell in place like that. Finally, after all the 5″ squares were sewed together in strips, and after the strips were all sewed together, we clipped** all the raw edges on the right side of the quilt as close as we could to the seam as we could without clipping through it. Then it went into the washer a few times, so the edges could unravel as much as they could (it’ll still continue to unravel a little every time it’s washed until it looks even fuzzier and, hopefully, better). DONE! Now we’re actually thinking about canceling all the rest of the lectures and concerts and outside distractions until spring comes around again. There is one thing I do worry about though. When my granddaughter saw the quilt a few days before I finished it, she grabbed it and said Oh thank you, Grandma! Since I made her a giraffe quilt she’d asked for last Christmas, she assumes when I’m working on a quilt, it’s for her. I may have to hide it when she comes over! Disclaimer: While the events in this story are all true, they didn’t necessarily happen quite like I said, and I may have lied a little bit about the sequence and I may have speeded up the process a teeny bit. It shouldn’t take 12 years like it did for me, but it will take a few days of even the most dedicated and skillful crafter! By the way, this project is easy, so easy in fact it doesn’t require a pattern or expensive fabric–you could even cut up and use up all those out-of-style, faded bluejeans that would fray beautifully. *52 card pickup: I have very small hands for my size (5’4″) so you can imagine how much smaller they were when I was a child. When I tried to shuffle cards on the rare occasions I played with my cousins, I’d drop all the cards on the floor and pick them up one by and and stack them in random order. They only complained about my shuffling method if I happened to win. **If you’re thinking of making a lap quilt like this for yourself, one that involves snipping raw seams to make this fuzzy effect, DO YOURSELF A FAVOR and buy a pair of those rag quilt snips from one of the fabric stores. They cost around $20, but if you wait awhile and watch the ads, you can frequently come up with a 50% one item coupon so you can get a pair like I did for $10. They’ll be worth every penny and your hands will be so grateful. Love it!! I want one – you’re going to have to teach me. Please keep the snow there for several more weeks. I really like it Alice!!!!!! And yeah, keep the snow in Utah — I’m enough of a hermit without adding a good excuse to be one!!! I’m a bit like you in that I sometimes take a long time to finish stuff. But I usually get there in the end. That quilt was beautiful. Well done! Oh but it’s beautiful. It almost makes me wish I could sew. 52-card pick up was a gotcha game where I grew up: you’d ask someone if they wanted to play and when someone was foolish enough to say yes, you could flick all the cards onto the ground and tell them to round ’em up, partner. Wonderful quilt. And what a neat crafting table. I wouldn’t dare photograph mine. I’ve been told my workroom is uniquely me. No one else has such a mess. Just delightful, and I so like your sewing room with the unfinished quilt hanging on the walls. Hurrah….another person who puts off working on projects just like I do. Now the snow is a different matter. I’ll have to go see if G’s brother is snowed in north of you. 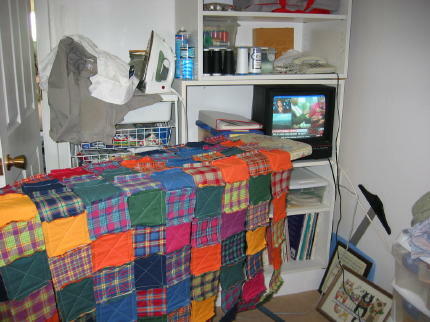 The quilt looks great and cosy. I mostly like the fact that I finally finished something! 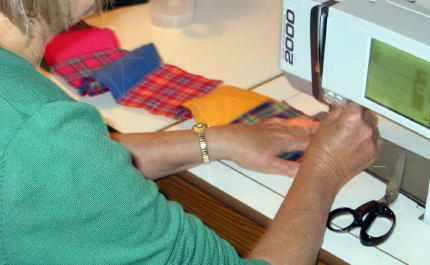 The sewing machine is an old one by electronic standards–I got in the early 2000s. It’s a Bernina Artista 2000 that has an embroidery attachment with it to do fancy stuff (which I’ve only tried once or twice). It also has a “quilting stitch” that looks like hand stitches but perfectly spaced. I wish I had more time to spend with it. I’m still working on the tea. I thought it was of the Bernina family, I use a Pfaff that I bought in the early 1990s. It has given faithful service in all those years, I am loathe to update it.